Aberahmanne\'s mother feeds him a Plumpy Nut (RUTF) during the appetite test at CRENAS centre in Mbera camp. Aberahmanne was brought in for screening by his mother who said that he had a fever and diarrhea. Anthropometric Measurement indicated that he is severely malnourished. 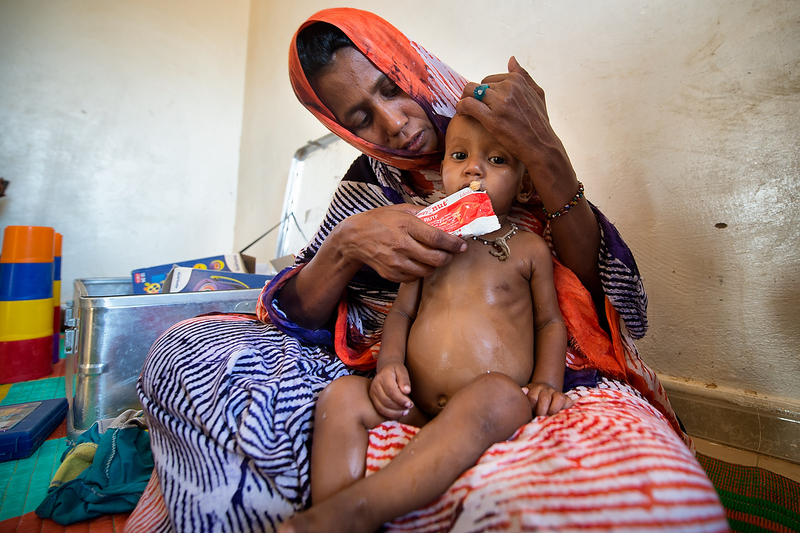 Subsequent to examination and anthropometric measurements, Aberahmanne was diagnosed with Severe Acute Malnutrition (SAM) and will need to undergo appetite test before he is referred further to CRENI for clinical treatment of malnutrition. In Mbera refugee camp, the Nutrition survey carried out in November 2014 showed a significant decrease of both global acute malnutrition (from 11.8 to 9.9%) and severe acute malnutrition (1.4% to 0.8) rates. As of today, UNICEF has been supporting the government nutrition center in the treatment of 444 severe acute malnutrition (SAM) cases and contributed to the treatment of 790 other SAM cases.